Q. Why does the Library have holiday decorations that only represent one belief system? 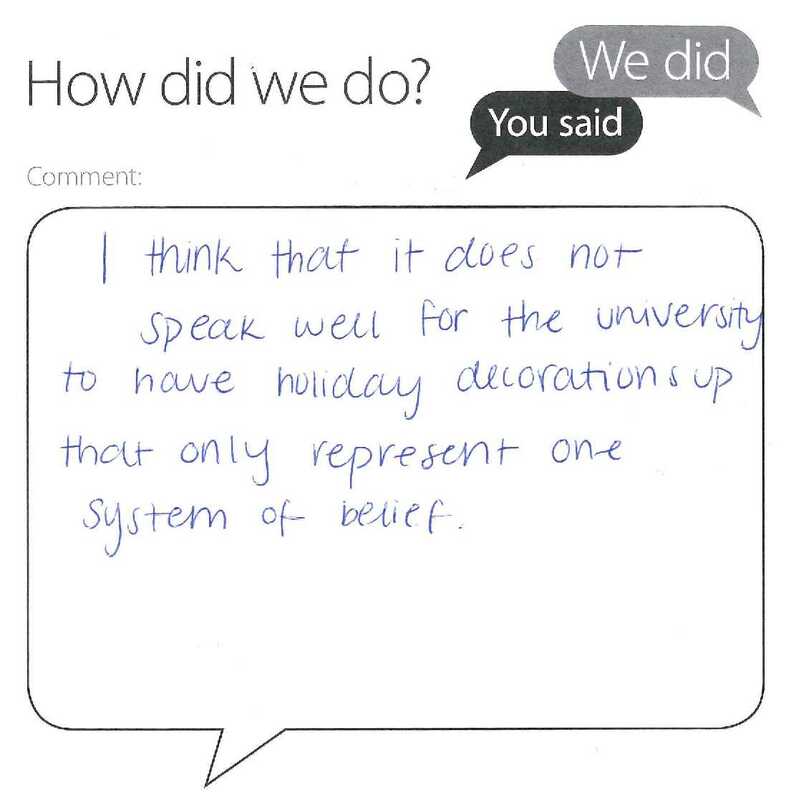 Thanks for your Library comments card from last Monday and you make a very interesting point about our Christmas decorations. We have been putting a Christmas tree up in the Main Library for many years and I do know that there are quite a few elsewhere on campus – e.g. the large tree in St Salvator’s Quad and another in the Arts Building lobby. Scotland is of course a traditionally Christian country so the display of Christmas trees is a long-standing custom. Christmas is also a holiday period which for many people is more cultural than religious, particularly has society has become more secular. I’m sure you’re also aware that the Christmas tree, while a symbol of Christmas, has roots in pre-Christian European spirituality. I did speak with the University Chaplain about your feedback (although I did not disclose your name) and Donald is very happy to speak with you in person if you’d like to contact him directly. The Chaplaincy supports students and staff of all faiths (or no faith) and philosophies of life. Their role is to encourage the University to respect students’ expression of their faith, including holidays and festivals. by anonymous on Dec 13, 2017.